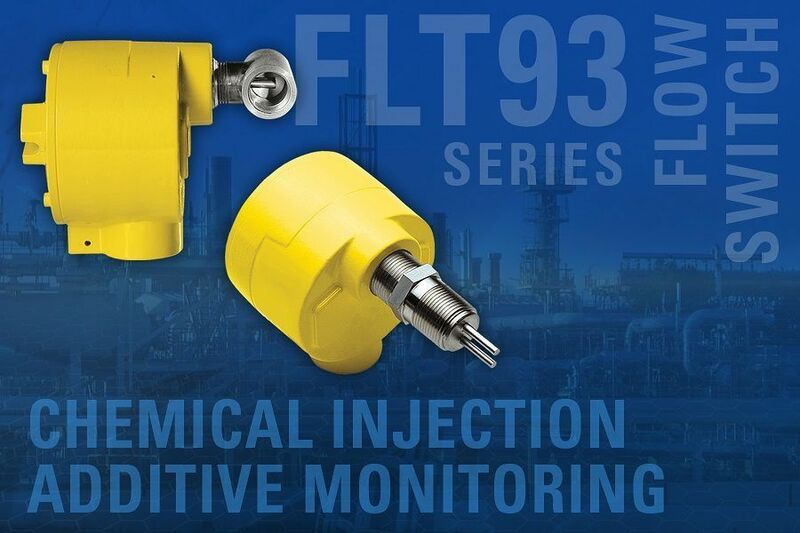 Oil and gas processing, water/wastewater treatment and other industries that utilise chemical injection or additive monitoring in their product processing and operations will find the FLT93 Flow Switch Series from Fluid Components International (FCI) provides a highly reliable and rugged solution for verifying chemicals or additives are being injected and ensuring injection pumps and feeders continue to operate. The advanced FLT93 Flow Switch is suitable for flow detection of liquids or gases and is available in several wetted materials for compatibility with virtually any fluid. It is a dual-function instrument capable of monitoring and alarming on both flow and temperature in a single device. Dual 6A relay outputs are standard and are assignable to flow or temperature. The FLT93 flow switches can be specified in either insertion or inline styles for installation in pipe/tube diameters from 0.25 inch and larger. For monitoring chemical and other additive injection flow in small line sizes, the model FLT93L is an ultra-sensitive, inline-type flow switch that can detect liquid flow rates as low as 0.015 cc/sec and gas flow rates down to 0.6 cc/sec. Models FLT93S and FLT93F are insertion types and are the solution for liquids and gases in larger diameter pipe sizes, respectively. And, for sanitary processes, the Model FLT93C provides 20Ra electro-polished 316L stainless steel wetted parts and tri-clamp sanitary flanges to meet the requirements in the food, beverage and pharmaceutical industries. The FLT93 Flow Switch utilizes thermal dispersion technology, which has no-moving parts to foul or clog, and requires no routine maintenance and longest service life. Its electronics are housed in a NEMA 4X/IP67 rated aluminum or stainless steel enclosures to deliver outstanding durability and reliability under the harshest process conditions. As further testament to this reliability, the FLT93 Series is SIL 2 compliant and carries a 3-year warranty. Their superior temperature compensation assures no false trips should fluid or ambient temperatures change. The FLT93 flow switches feature a universal 24Vdc/85V-265Vac power supply, temperature service up to 454°C and a broad selection of process connections including compression fittings, flanges, packing glands. Agency approvals and certifications include: FM, FMc, ATEX, IECEx, Inmetro and EAC/TR CU for Div.1/Zone 1 areas, CE, CRN, PED and RoHS compliant.